Birthday: December 25 Height: 162 cm Weight: 48 kg Sizes: 88-57-85 Species: Angeloid Likes: Petting round things, watermelons, small chickens. She introduces herself as Pet-Class (Translated "Entertainment-Purpose" in the manga) Angeloid type Alpha: "Ikaros". She becomes bonded to Tomoki at the beginning of the story, after saving him when he tried to save her. Ikaros displays a very submissive, melancholic personality, and is completely subservient to Tomoki's wishes. Ikaros possesses the ability to grant seemingly any wish through the use of several techno-magical cards. Despite her passive appearance, Ikaros has displayed moments of aggressiveness when Tomoki's life appears to be in danger. She weighs 48 kilograms, stands at 162cm and her wing type is listed as "Variable". Her "Variable" wings are extremely valuable and are highly desired by Synapse. Ikaros loves petting round things, especially watermelons, she even has a farm full of them. Even when Tomoki tried to take a watermelon from her, to cut it and eat it, she didn't give it to him, and kept it to herself. She begins the series with a poor grasp of human emotion, but after Nymph tries to unlock her memory to make her realize she isn't a "Pet-Class Angeloid". Ikaros' memories on "Self-Repair" is also unlocked though, and she quickly unlocks the rest of the restraints put upon her, making her weapons and emotions effective. As the story progresses it becomes clear that Ikaros is not merely a "Pet-Class" Angeloid, she is actually a "Battle-Class" Angeloid. After she realises that she's a "killing machine", she tries to keep it a secret from his master - Tomoki. She takes little harm when she is shot, she is capable of flight at Mach 24, and is able to withstand pressure way better than most submarines. In the past, she was called the "Queen of the Skies" and "Uranus Queen", and responsible for throwing the Heavens into disorder. She was originally sent to Earth as a weapon of judgment and is possibly responsible for destroying The Tower of Babel. 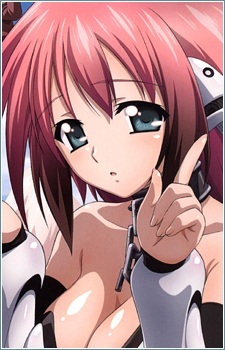 As the series progresses, Ikaros begins to develop her feelings for Tomoki. However, since she is lacking in emotional figure, it takes time for her to realize her feelings. Later on, she misunderstands Tomoki proposing to her during one of Mikako's planned activities and asks the others about it. When she thinks of Tomoki, Ikaros feels a "pain from her reactor". At the end of the eleventh episode when the pain reaches its peak she shuts down, and reboots. When she awakens Nymph discovers she was on the verge of losing her memories. At the end of episode 9 of 1st season of Sora no Otoshimono ( Sora no Otoshimono ), Ikaros kisses Tomoki. At the end of 2nd season of Sora no Otoshimono (Sora no Otoshimono: Forte ) , after mistaking Tomoki's saying " We'll be together forever " as a propose, she almost gets married with Tomoki, after telling that to Mikako.